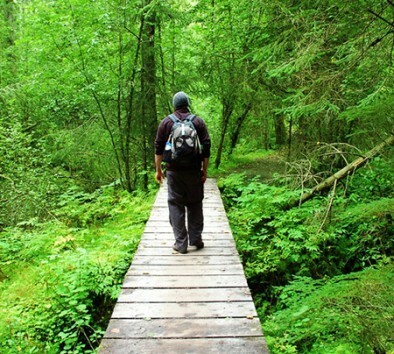 Stretch your legs and fill your senses with the beauty of Kenai on a guided nature hike. You’ll hike over fairly level terrain and on a wide, well-maintained gravel trail that leads you through a spruce-filled forest passing mountain creeks and verdant meadows shimmering with wildflowers. The path leads you to the rushing waters of the Russian River Falls, where tens of thousands of sockeye salmon can be seen on their way to their spawning grounds depending on the time of season. Once you reach the Falls, take a moment to immerse yourself in the stunning setting and observe your surroundings from one of two viewing decks overlooking the falls. Your naturalist guide will gladly share information about the area along the way and explain Native Alaskan uses for the various plants encountered on the trail. Wear sturdy, comfortable walking shoes. Guests with back, neck, heart or mobility problems are not allowed to participate. Hike is approximately 3 hours.